New line Paola Reina dolls - Gorjuss of Santoro. Why dolls Gorjuss of Santoro have no mouths and noses? There are some explanations of this. Let’s look at their unusual faces. They have only two asymmetrical eyes like beads and pink cheeks. This image is easy to remember. May be it is a secret of the success? There are also emotional and philosophical explanation why the dolls have not mouths and noses. The doll reflects mood of her owner very easy. 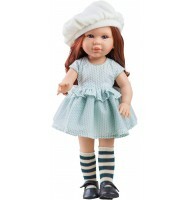 It gets all emotions of her owner and the doll will be on “one wave” with her forever. Watch the doll’s face. If you are sad the Gorjuss of Santoro will look at you sad too. If you have nice mood, the face of the doll looks at you with gladness. This dolls are accepted how they are, but may be not too serious. You can draw nose and mouth to it, but it will be someone not Gorjuss of Santoro. Without the mouth and nose, you get to form your own opinion as a viewer with the help of the surroundings. Also there is another explanation. Any dolls do not appear themselves. They get life with help imagination and will their creators. Many years ago dolls were dressed in national costume, but had not drawing faces. People believed the doll without face have no soul and evil spirit could not be inside it. So it was harmless for a child. It was not only a toy, it defense the child. The Paola Reina dolls hold a special place in the doll world. They have achieved considerable success in over 33 countires on 5 continents. The aim of the Spanish company is to dissolve boundaries between ethnic groups, developing tolerance since childhood. This is why you can find Asians, Europeans, mulattos among these dolls. The dolls are unique. They became the objects of desire not only of young ladies, but also of collectors from all over the world long time ago. The face and body of these dolls have been worked through to the last detail: their eloquent eyes are surrounded with luscious rich lashes, they have wonderful thick hair and delicate fingers. All dolls are dressed in bright modern clothes made from natural fabrics. The dolls are dressed by a world-renowned fashion designer Ruth Treffeisen. And, of course, the famous vanilla aroma – the pride of the company. Each doll has this smell. These dolls strike a chord even with the most demanding customers.You just want to cuddle and cradle them in your arms so much! She is not perfect, but if she can make you laugh at least once, if he can trill you, if she can make you smile, surely she takes out the best of you, she will give you an illusion, game, fantasy. Smile, when she makes you happy and miss her when she is not with you. Love it with all your heart when you receive her love, because the perfect doll does not exist, but there will always be a doll that is perfect for you. Welcome to the world of dolls Paola Reina.